I was very lucky to be sent a Supermarket Smarty for review! What is that you may ask? 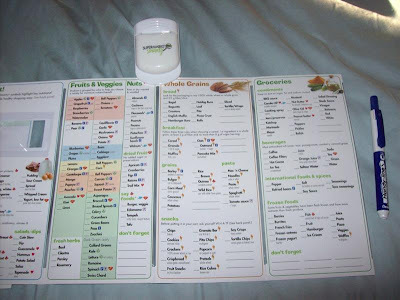 Well it is a reusable healthy grocery shopping list. If I worked as a nutritionist for healthy living or weight loss, this would be a product that I would definitely recommend to clients. It is easy to use. It comes with a dry erase marker so that you can write on there what you need. Also, the list is very detailed and has many options to check. Also, you can buy one for only $9.99 on their website! Not bad at all since you can reuse it many times. Also, as a coupon clipper, I think that it is great that it has a coupon pocket! It has a meal planning section and a notes section too. Pretty much it has everything that you would need for grocery shopping besides your credit card! I will be using this weekly for grocery shopping! Great product! Thanks Supermarket Smarty! Thank you for coming by my blog and following me. I am now following you too. I'm now following you back and look forward to your posts. Thank you for the follow. I am following you back & look forward to your posts. Have a great evening! Thanks for the follow! I am now a follower of you! I like your blog, this product is very cool!!! Thanks for following me - I'm following now too! This shopping tool looks pretty cool - I'll have to check it out. Thanks for stopping by my blog for WW!! Can't wait to read more of yours! I think I'll be able to use a lot of in my life! I'm already following you, but thanks for stopping by Bargain Mom! Following you back!! Thanks for stopping by!! This looks like a great help!! Following you back, thank you for your sweet visit. That's a great tool. I'm always so disorganized with my shopping.